Puppy kibble is designed to meet your pup's nutritional needs during its rapid growth period. 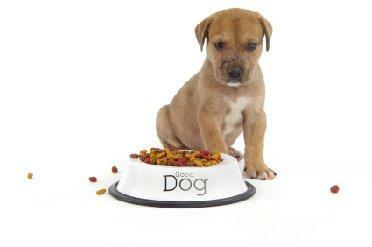 Since puppies come in all shapes and sizes, their feeding requirements will vary. Learn the particulars of how much and when to feed your canine youngster. You wouldn't feed an infant a cheeseburger, would you? Of course not. You'd start your baby on nutritious foods that were specially prepared to meet her needs at this delicate stage of her life. A puppy is very much like an infant. He has very specific dietary needs to help him grow into a healthy adult, and these needs vary from breed to breed and size to size. Ideally, each puppy should be fed enough to bring it into prime condition for its current frame size. This means not being too fat or too thin, although all puppies will experience sporadic growth spurts that require a little time for proper weight to catch up. Puppy kibble is formulated to provide higher levels of protein, vitamins, and minerals than adult dog food in order to support accelerated growth. To better understand this concept, let's compare the guaranteed analysis between puppy and adult diets from Purina Dog Food. Keeping in mind all we've learned about puppy diets so far, let's now look at some general feeding guidelines. Every puppy is an individual, but the following guidelines should help you develop a feeding schedule to best suit your pet's needs. Small dogs are generally considered to weigh in at twenty pounds or less. These dogs go through a rapid growth period that usually sees them attain their full adult size by one year of age. This means they metabolize their food at a very high rate. Most small breeds can be switched over to adult diets around one year of age. Begin with a ratio of three parts puppy kibble to one part adult diet, and gradually replace more of the puppy diet with the adult until the switch is complete. Most medium breeds are ready to make the change from puppy to adult diets between twelve and fifteen months. Follow the method described for small dogs. Large dog breeds are typically classified as those weighing fifty pounds or more as adults. This group takes much longer to reach maturity, sometimes as long as two to three years. The metabolism rate for this group is quite slower than it is for small dogs, so you must choose a puppy kibble formulated to support long term skeletal growth while not being as high in fat as to cause excessive weight gain that could lead to joint stress and skeletal complications as adults. Large breeds are rarely ready to switch to an adult diet before two years of age. As with small and medium breeds, make the change gradually to avoid a digestive upset. Choose a puppy kibble formulated to meet the needs of your dog's breed size. Feed according to the guidelines listed above or on the package. Gear your feeding program toward achieving overall condition, not just toward reaching an arbitrary weight goal that may not be exactly right for your individual pet. Feed a puppy diet until your pet reaches maturity, usually around one year of age for small to medium dogs, and around two to three years for large breeds. Make a gradual transition to an adult diet to give your pet's system time to adjust.